Just after Tun Dr Mahathir celebrated his 90th birthday, he wrote a blog entry titled Conspiracy. Basically, what he says in a generalised manner is that since everything is out in the open, there is no conspiracy. I truly beg to differ. So tell me now. Is there a conspiracy or not? Happy belated 90th birthday, Tun M.
I would like to share a few opinion of mine on your latest blog post today titled "Conspiracy" - from one rakyat blogger (me) to another blogger (Che Det). 1. There has been much talk by certain people of a conspiracy to overthrow Dato Sri Najib as Prime Minister. 2. Is there a conspiracy? Is there someone or some group conspiring i.e moving in secret in the underground to overthrow Najib. There could have been before but apart from people complaining privately about their dissatisfaction with Najib’s administration, no one was planning his overthrow. That is not to say that they did welcome the idea of his resigning or vacating his post. But active underground planning and action there was none. 3. What we do know now is that I had openly called for his stepping down. No conspiracy. Just open declaration to the whole nation that I would like to see Najib cease to be Prime Minister. 4 So if any investigation is to be made, there is no need for detectives or special agents. That there is a move or push for Dato Sri Najib to step down is known to everyone. 5. So again where is the conspiracy!! It is all in the open. There is no need to conspire. There is open campaigning for his ceasing to be Prime Minister.No. I am sure there are no conspiracies, whatsoever. Just a bunch of old friends who happens to catching up for old time sakes. I am sure you and your friends have been best of buddies with British National Clare Brown, - who so happens to run the Sarawak Report who has been critical of Government since it was started in 2011 - for a long long time. Here are some happy pictures from the January 14th 2015 "catch-up session" at Tun M's own office which was proudly published by Sarawak Report itself. No conspiracy either - just a Wefie of a catch-up session between two very dear old friends who were never critical of each other and always on the same side of truth, justice and fairness. It is just pure coincidence that within a month of this catch up at Tun M's office, Sarawak Report then published their "Heist of the Century" article with a bunch of (apparently tampered) documents about 1MDB and PetroSaudi's deal. And of course, the legally bankrupt Datuk Khairuddin Abu Hassan also happened to make a MACC report against 1MDB the next day on Jan 15th after your catch-up with Clare Brown. 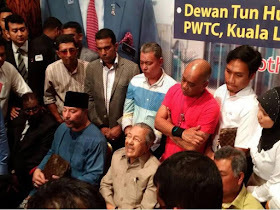 Of course, Khairuddin and Tun M are just normal friends and they happened to bump into each other at the Nothing2Lose forum a few months later and happened to be sitted next to each other. So happens that Khairuddin and Sarawak Report's Clare Brown are also common friends (it's a small small world after all) and Khairuddin then went to London and met Clare Brown a few days before 1st July 2015 - probably for tea with biscuits and scones too. Khairuddin in his FB post said it was "Secara kebetulan saya sempat berjumpa dengan kawan baik iaitu claire rewcastle brown; editor sarawak report di london beberapa hari yang lepas.". RM100 big and RM100 small please: Can start buying 4D already. Who knows? So happen to bumping into by chance that 1 person out of 8.3 million in London is 830,000 times better odds than the 1 out of 10,000 that you get with striking top price in 4D. Of course secara kebetulan since London is a small city of 8.31 million people only and just a mere 5.5 times bigger than Kuala Lumpur. Little bit bigger only. Not much. What a coincidence ! Secara kebetulan we manage to meet in London. It must be fate! 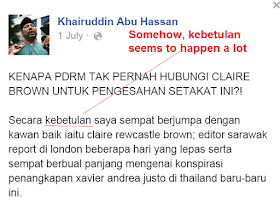 Of course it was again another amazing "kebetulan" that just the next day after Khairuddin posted that he had secara kebetulan met Clare Brown a few days earlier, Wall Street Journal and Sarawak Report so happens to get their hands on some documents of unknown origins which Sarawak Report then posted "Sensational findings". Yup. More "kebetulan". It's Magnum 4D time for sure. However, luck is not always on your side. It's just a bit of bad luck that Sarawak Report's Clare Brown may be in a bit of trouble right now since Thai Police have pretty much confirmed that stolen documents sold by Xavier Justo, which after having left Justo's hands to Sarawak Report had been tampered with in minor but important ways to led to significant change in meaning. "This wrongdoing took place in Singapore," he said, adding that police found traces of the data being tampered with by the buyer." Thai police Chief said "The data on the *Sarawak Report) blog has been TAMPERED WITH to discredit PM Najib." "Asked whether the tampering was extensive, Thai police spokesperson major-general Prawut Tavornsiri told Malaysiakini: "The changes are small, but important". Oops!! Re-confirmation that after the documents left Xavier Justo, someone had made "small but important" changes. As a side-note and "secara kebetulan", Thailand Police Chief also said at least one out of the 10 persons who had made contact with Xavier Justo is from UMNO. Thailand English newspaper, The Nation had reported that this person includes a "former key politician" in Malaysia. How key and how former? And since Datuk Khairuddin has such good fortune to bump into Clare Brown in the 8.3million population London, perhaps he could use his extra-ordinary luck to help us guess who this "former key politician" is? It gets worse! Singapore authorties could be getting involved too as apparently Justo's case also involves money-laundering. The spokesman also offered to share information with the Singapore police. "This case should be reported in Singapore because the money laundering to attack the PM started in Singapore," he said. "If the Singapore police ask me for evidence (through) the foreign affairs protocol, I can send it." Just so you know, the penalties for money laundering in Singapore is up to ten years jail. Good luck! Anyway, Tun Mahathir is definitely incapable of lying since he is apparently "Anugerah Allah" (according to PERKASA's Ibrahim Ali) and we do believe him when he said he there is no conspiracy. - just heck of a lot of kebetulan and tampered documents only. Definitely, we also believe Tun Mahathir when he repeated many times recently that Malaysia is in the top ten most corrupt countries in the world - despite the fact that Malaysia is ranked by Transparency International in their 2014 Corruption Perceptions Index at the top 30% least corrupt in the world at number 50th place out of 174 countries. NOT EDITED!!! 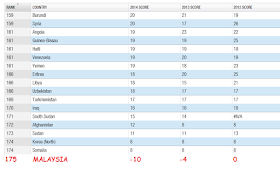 (not) : As you can see in the Transparency International 2014 table Malaysia is most corrupted in the world - we are not 50th out of 174 least corrupt - but at number 175th out of 174 most corrupt. Of course ordinary Malaysians brought up on a steady diet of DAP's lies and propaganda would know that Malaysians are worse-off than happy places such as Syria, North Korea, Somalia etc..
6. Lately we are seeing many funny statements. The Utusan loudly proclaimed that the Prime Minister had taken action against the Wall Street Journal. 7. Actually it was not legal action or suing for defamation. Just politely asking the Wall Street Journal why do they publish the article. 8. Is there a need to ask that silly question? Isn’t it obvious that as a newspaper the information obtained by Wall Street Journal was sensational. Any newspaper, convinced of the authenticity of the information would have printed it. Of course the local mainstream papers will not for obvious reasons. 9. To ingratiate themselves with the Prime Minister they would rather mislead people. The sub-editors are good at writing misleading headlines. For example when a statement is made to let the task force of four do their work this is headlined as support for the Prime Minister. Sorry Tun M, you may be mistaken here again or perhaps did not read Najib's lawyer letter to WSJ properly..
Najib's lawyer letter did not ask WHY the Wall Street Journal published the article. Najib's letter, please understand that this is just the first step in the process and is necessary before a specific defamation charge can be filed. This is because WSJ was a bit cowardly in their article and Najib's lawyers want to nail their position. WSJ had said in their very same article that they did not know where the funds comes from but on the other hand they said the funds comes from 1MDB. It's like WSJ saying we are not sure whether the ball is blue or whether it is indeed a ball and then saying the ball is blue. So, which is which? Did WSJ say Najib stole the RM2.6b from 1MDB and masuk poket or not? WSJ needs to confirm this. Najib's lawyer letter stated this: "In the circumstances, we are instructed by our Client to seek confirmation as to whether it is your position as taken in the Articles that our Client misappropriated nearly USD 700 million from 1Malaysia Development Berhad?" Therefore, Najib's letter is to nail down WSJ's position before they can proceed to the next stage. If Najib sued WSJ saying that WSJ defamed Najib by saying he stole money from 1MDB, WSJ could easily say This is to prevent WSJ from saying "but we also said we don't know where the funds were from". "please let us know whether you have appointed solicitors in Malaysia to accept service of legal proceedings on your behalf and on behalf of the reporters who wrote the Articles". Looks like Najib is following Singapore's advice and suing under Malaysian laws and courts which are much stricter. Remember that this is a first step. Najib has never stopped his legal proceedings against Mkini, Tony Pua and Rafizi and definitely won't be pulling back this time on WSJ. And even more shocking! of all people, Anwar Ibrahim's Chief legal council Sankaran Nair also agrees with my view and Najib lawyer's legal letter to WSJ. And this lawyer is famous for representing Anwar in many of his famous RM50 million or RM100 million "you ulang, I saman" defamation suits against others. Lawyer S.N. Nair was of the view that it was not an exception to ask for clarification and particulars before filing a civil action. "I have adopted this step before making demands and instituting lawsuits on behalf of my clients," he added. Nair, who has represented former opposition leader Datuk Seri Anwar Ibrahim in defamation suits, said he would expect a responsible lawyer to act prudently. "In the course of carrying out one's professional duty, a lawyer must also ensure his or her reputation is not at stake," he added. Unless Tun M is a lawyer or have vast experience in defamation cases, perhaps Tun M should not have called the lawyer letter as silly. For the record, Tun M apparently has never sued anyone for defamation in his life - he either suspends all the Supreme Court judges, throws people in ISA or just ignores all those very very nasty things said about him by foreign media and DAP over the past decades and pretends not to hear them. 10. Then there was a minister who, after saying that the interim report shows nothing wrong with 1MDB, then went on to advise people not to say anything about 1MDB until the report is out. But he himself had made a premature statement. 11. To all comments made against 1MDB, the standard answer is to deny, to say “No it is not true.” It is like somebody upon being asked whether he had stolen the money as alleged, simply denies that he had stolen, expecting the judge to acquit him simply because he denied. 12. There is no denial that money was deposited in the private account. 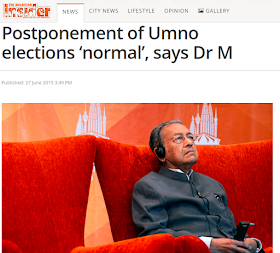 The explanation to UMNO is that it was for the elections. UMNO seems satisfied. Don’t they know that Government money cannot be used to help a political party to win elections? But the money was from donation. Who donated 2 billion Ringgit? No answer. Since the report and investigations have not come out now, how did Tun M come to the conclusion that the alleged money is from government? Already the Auditor-General's preliminary report and the international auditor Deloitte also cannot find proof of any money missing from 1MDB. So, if no money is missing from 1MDB then how did 1MDB money get stolen? Strange. Is Tun M suggesting that UMNO is now a poor party after he left it and all those alleged UMNO-linked or allegedly UMNO-owned firms of the past such as Renong, KUB, Tanjung, Media Prima, Peremba, Time, TRI etc have all ceased to exist? What happened to all their money and their companies? And how the heck did Tun M fund past General elections before? Out of your own pocket? And are you sure there are no companies or tycoons willing to donate money to the ruling party, UMNO-BN for the purpose of elections? And do you seriously believe that we should list out the names of all the donors who probably wants to keep their donations private for fear of public boycotts? Even DAP disagrees with making political donors transparent at the moment. DAP election strategist Dr Ong Kian Ming, who is also Serdang MP, says the proposal to regulate political finances would only be viable if there is a genuinely level playing field.“My fear is that this may be used as a tool to ‘scare’ people off from contributing to opposition parties. It is truly astonishing that Tun M is now asking for all the donors to be listed publicly right now - it's just not going to happen, is unrealistic and Tun M understands the reasons why. Anyway, since Tun M says that UMNO members seem to accept this reason now, then I see no reason why Najib needs to resign as UMNO president and Prime Minister right now. Okay, let's continue with Tun M's blog. It's getting a bit long now. 13. But what about BR1M? Isn’t it Government money, all 7 billion Ringgit and more. That was clever. It is not for elections but given before any election, with the promise of more if the party wins, isn’t it about using Government money to win elections?14. Truly cash is king!! BR1M was given in 2012 (not election year), in 2013 (election year), 2014 (not election year), 2015 (not election year) and will probably be given in 2016 (probably not election year) and in 2012 (probably not election year) - therefore Tun M's dissertation that BR1M is given just before election is WRONG! How can BR1M be an election bribe by BN if it is paid every year and not just on election year? How can BR1M be an election bribe by BN if Pakatan had already said that they will continue BR1M if they win and hence remove any advantage that the govt has with just one statement? Many countries have BR1M like schemes - such as the USA's famous food stamps program which they have been running for decades. There is no doubt that programs such as BR1M helps in transferring money from the rich to the poor directly and can assist in reducing our income inequality. Only very deluded people thinks that BR1M is a replacement for a normal salary and makes the people dependent on govt or makes them lazy. How can anyone or any family live with RM600 a year or RM1.65 per day? BR1M is not meant to be a salary replacement but a supplement to their normal salary so that they can live better! Yes, there could be abuses in BR1M where money could have been given to people that don't deserve it but with so many people avoiding income tax and properly declaring their assets, how can we 100% avoid such abuses? Even in the unlikely event that up to 5% of the people are abusing this system, the fact that 95% of the people are receiving much needed help is more than enough reason to continue with BR1M. Govt just needs to continually tighten up monitoring and weed out the abusers. Do we punish the 95% of those who needs it most for the actions of the 5%? Tun M, as you can see from above, BR1M is a policy tool to re-distribute income already used in many countries and has now been proven effective in Malaysia..
As policy measures such as BR1M and minimum wages take effect, Income inequality is on the decline in Malaysia while all income groups experience significant yearly growth in income levels. As a result, the Gini co-efficient that monitors income equality has seen a drop from 0.441 in 2009 to 0.401 in 2014. The lower the Gini score, the more equal it is. No prizes for guessing who made income inequality so high before Najib became PM and implemented all these policy measures to improve equality. Maybe you should ask Tun M or his friends, Daim, Halim Saad, Tajuddin Ramli, Ananda Krishnan etc why it was so unequal in the past. 15. Then there is this insistence that since Najib was elected, no one has any right to demand he should step down. 16. How short is their memory. Don’t they remember Abdullah who was also elected being asked by Najib to step down. And he did. 17. And I myself, also an elected PM, did step down in 2003. 18. All over the world elected Presidents and Prime Ministers have been asked or forced to step down and they all did. In fact in some countries, if something untoward happens, Ministers, Prime Ministers step down. 19. So don’t be silly and demand that since Najib was elected, no one has a right to ask him to step down. Abdullah won more seats in 2008 than Najib in 2013. If Abdullah was prepared to step down, Najib after his poor performance in the general election should not even offer to be the PM. He should resign from being President of UMNO and head of BN and let somebody else lead and become PM. Well, I am not sure if PM Najib ever asked Pak Lah to step down as Prime Minister since all the public pressure for Pak Lah to step down seemed to have come from Tun M.
And Pak Lah has never accused Najib of asking him to step down and continues to blame Tun M until this day. 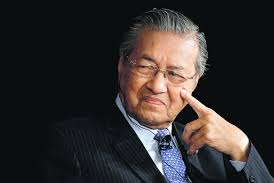 If I listened to Mahathir, Malaysia would be bankrupt said Pak Lah. “Perhaps I should have been more vehement in defending and explaining these issues. I could have retaliated by exposing Mahathir. But what good would have come out of this for the government and party?” he said. He did not lose any state govt. Tun M had lost Kelantan and Terengganu state govts in the past and he never won them back - ever. Hence, Najib actually did pretty well for UMNO in GE13 and hence as President of UMNO, he becomes president of BN and by default, the Prime Minister. I guess UMNO is relatively happy with Najib and hence UMNO leaders agree to postpone their party elections to 2018 after GE14 and you yourself say it is normal. Glad you agree, Tun M and glad that Tun M respects the decision of UMNO leaders. And due to the systems that Tun M have put in place before, then there is certainly no need for PM Najib to resign if he does not want to resign - just because you felt ignored and wants him to resign. 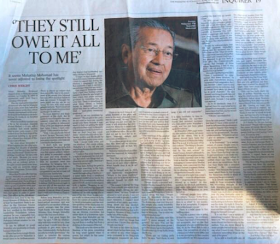 Although Tun M may feel that "They still owe it all to you" as per your recent interview in Australia, I think PM Najib owes it to Malaysia to complete his transformation journey and implement unpopular but necessary and urgent policies such as BR1M, Minimum wages, subsidy rationalization, tax reforms such as GST and others. Policies that are unpopular now but necessary for long-term growth and sustainability of Malaysia's future. No economist in the world would say that Najib's policies above are wrong. I am sure Tun M understands this. 20. There is this suggestion that the amendment to the election rules in UMNO was meant to make it more democratic. Very many more members would vote in the UMNO elections than the 2,000 or so delegates to the UMNO General Assembly. 21. Actually the intention is to limit the number of entities involved in the election. The winners would be those getting the biggest number of divisions voting for. Effectively this means the real electors have been reduced from 2,000 to about 190 UMNO divisions. The number of members voting for a candidate is nullified. Far from making UMNO elections more democratic, Najib has actually restricted the right to vote from ordinary members to just the divisions. And Najib has a strangle-hold over most of the division heads. 22. So much for more democracy in UMNO. The previous bonus votes and quota system in the UMNO party elections and how it kept Tun M in power for 22 years. Bonus votes? got such things? I thought 1 person 1 vote. lo - unless the bonus votes comes from the non-existent 40k Banglas. Turns out the bonus votes are not like bonuslink points and the quota was not actually Bumi quotas when in the context of the UMNO party elections. Undemocratic Bonus system in the past - a bonus only to the incumbents and makes it hard for challengers to even get nominated. After the 1987 Team A vs Team B fight where Tun M won with only 43 votes against Ku Li despite receiving more nominations from the divisions, Tun M decided to change the way the party elections are determined. Using the excuse to of preventing “fake nominations”, Tun M then introduced the bonus-vote system in which 10 bonus votes would be automatically added to those contesting for party president for every nomination they receive. Definitely during the nominations stage, division leaders will be pressured to nominate the incumbent - hence this system essentially guarantees a win for the incumbent. Obviously this flaky bonus-vote system was not democratic. Thus, UMNO abolished this in 1998 and replaced it with an equally iffy quota system. This quota system requires those contesting for president to receive at least 30% of all divisions nominations BEFORE they even have the right to contest. This means that you require at least 63 divisions (out of 210 divisions then) to officially nominate you before you even qualify to challenge the president. Essentially, your fate depended on just 210 division heads that the President could easily control. Chances were not that good, of course. In essence, the "Bonus votes" and "Quota system" were cowardly undemocratic systems put in place by Tun M to prevent any challenge to him. However, Najib did not wish to hide behind the quota system and scrapped it in Oct 2009 - meaning that anyone who received a nomination from any division can challenge for any post within UMNO. Also in an effort to curb money politics, Najib increased the number of people qualified to vote from just 2,500 to 146,500 UMNO members. Compared to the nomination and quota system previously which depended on just 210 persons to determine who can be President, trying to control and buy votes from 146,500 people is much much harder. Najib was this brave enough to transform the party and also democratic enough to put the fate of his PM and party president position in the hands of 146,500 party members - which he did in the 2013 UMNO party elections. This new UMNO party elections system introduced by UMNO in 2009 is called the electoral college system - the very same system used in the USA presidential elections. I am sure you don't really want to accuse the USA of having unfair elections system. UMNO Sec-Gen Tengku Adnan said the system was chosen for the party elections, which for the first time will see about 150,000 members voting for supreme council members, as it was deemed the most practical due to the large number of voters involved. It is certainly insulting to all UMNO membes when Tun M says that the division leaders of 190 division will determine the votes for that division. Assoc Prof Shaharuddin Badaruddin from Universiti Teknologi Mara (UiTM) said that while division chiefs sympathetic towards certain candidates could attempt to sway their members’ sentiments by organising activities for the candidates, they would still not be able to guarantee votes because of the large number of branch members who will be voting. Please respect the large number of UMNO branch members and give them credit - their votes now make a difference and is what counts and they should be independent to vote who they want without having to follow the orders of the branch leaders blindly. Hence, Tun M is mistaken again. UMNO party elections have become more democratic and less about money politics. At least after PM Najib's UMNO elections reforms, people actually gets a chance to be nominated (all you need is one nomination) and to contest - unlike your dodgy bonus votes and quota nomination system which stopped candidates from even being nominated and even before they had a chance to run.